Located at the foot of the Blue Ridge Mountains, the Piedmont of northern Virginia is renowned for its scenery, historical significance, productive farms, and thriving communities. It also includes several of the fastest growing jurisdictions in the nation. To conserve the cultural and natural values of this nine county, in 1972 community leaders established the Piedmont Environmental Council (PEC). Today PEC has racked up significant accomplishments in land conservation, protecting air and water quality, and preserving the region’s historic resources, and scenic viesheds all in the service of saving the Piedmont’s special sense of place and creating better places to live for all its citizens. As a regional conservation organization the PEC uses multiple strategies that stretch far beyond the traditional agenda of land trusts agenda of just protecting acres from development. The Council takes a holistic view of the Piedmont that seeks to preserve all elements of the region’s resources including its agricultural base, cultural and scenic landscapes, historic communities and main streets as well conserving land and restoring wildlife habitat. A good example the PECs approach is the initiatives around Working Farms and Food. 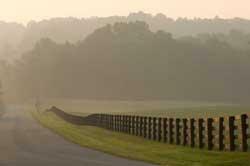 The region has 180,000 acres of farmland and 140,000 acres of forests under conservation. But keeping this land in production is the key to real protection of the land as open space and as a valued cultural landscape. To address transition planning for the farming community, PEC has developed a program that connects next generation farmers who need land with property owners who need help with leasing process. Courses are also offered on best practice topics such as pasture management and keeping working lands as healthy land. PEC is a strong supporter of the local foods movement with a Buy Fresh Buy Local campaign to connect consumers including restaurants owners and chefs to producers both farmers and artisans. PEC starts with citizen engagement, identifying what people care about and want to see passed on to the next generation. The organization then sees its role is to serve as an ally to those who want to take action to protect the historic places and natural resources from threats. A key factor is helping direct grassroots energy into outcome based results. 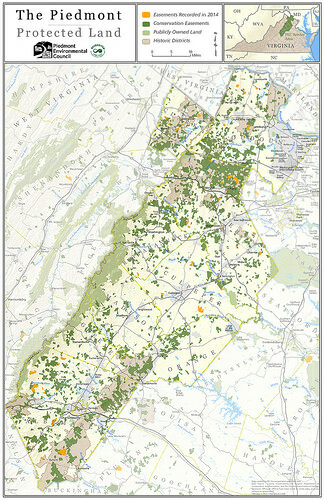 PEC has cutting edge mapping and other tools to help identify and visualize conservation issues and project impacts. They also have professional staff on the ground in the nine counties, with the expertise to assist local governments and also work in Washington and Richmond to advise both legislators and agency officials. The power of this approach in making a difference to Piedmont communities is apparent. 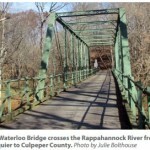 In 2014 community support and advocacy led to a reconsideration of plans to demolish the historic Waterloo Bridge over the Rappahannock. 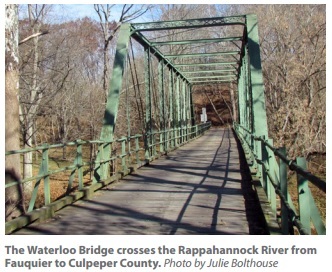 A coalition of local groups in Loudoun organized to help the Commonwealth of Virginia develop and enact a new policy for preserving rural roads. Piedmont landowners placed more than 6,500 acres of land under conservation easement, bringing the total amount of conservation land to over 375,000 acres. Read 2014 Annual Report. Some PEC’s most far-reaching work has been to tackle challenges that can only be tackled on a regional basis. These include above-ground electric transmission lines in view of Civil War battlefields, natural gas pipeline rights of way across National Historic Landmarks such as Montpelier or new transportation corridors that will open up farmland to development. This work requires citizen involvement, strong advocacy and new partnerships. PEC’s President Chris Miller is a active partner in other effort like the Choose Clean Water Coalition, the Chesapeake Watershed partnership, and the Journey through Hallowed Ground, National Heritage Area. PEC is a model for organizations who want to mobilize and get results on a landscape scale.